Monte Ahuja Endowed Dean's Chair and the 22nd dean of the College of Engineering at The Ohio State University, a leading research institution and one of the nation’s most distinguished land-grant universities. As Engineering Dean, Williams is responsible for the strategic vision, mission and goals of the college, oversees the education of more than 10,000 undergraduate and graduate students, leads a research program that expends $150M annually and is responsible for the administration of 950 combined faculty, research scientists and staff. Drawing on his extensive collaborative experience, Williams continues to create partnerships between the university, local and state governments, the Ohio business community, and regional and national partners including Battelle, Boeing, GE, Honda, NetJets, Wright Patterson Air Force Base and NASA Glenn. With his background in research, he is working to increase funding for Ohio State’s many internationally recognized research centers. Williams is accomplished at managing complex organizations under financial constraints and developing universities as engines of economic growth. He has a robust history of fundraising in the public and private sectors, bringing financial support to realize the institution’s strategic goals. During his tenure the college’s annual budget has increased by over 40% to almost $300M, and external gifts and donations have exceeded $370M. More than $300M has been invested in new and renovated facilities. The Ohio State University was founded in 1870; the Department of Mathematics and Engineering was one of seven original departments. Today, the College of Engineering offers 14 undergraduate and 12 graduate programs in 11 departments or centers, as well as three undergraduate and four graduate degrees in the Knowlton School of Architecture. The College of Engineering graduate program is ranked first in Ohio and 31st among all engineering schools nationally in the 2018 U.S. News & World Report listings. The publication also ranked Ohio State's engineering undergraduate academic program 30th among all universities whose highest degree is a doctorate. Among the college’s 360 full-time faculty, 12 are members of the National Academy of Engineering. There are more than 20 institutes, centers and laboratories which bring together faculty from many departments and other colleges to support industry and government with leading research in materials, aerospace, automotive, biomedical engineering, data analytics, electron microscopy, geospatial technology, manufacturing and wireless technology. During Williams’ tenure The College of Engineering has seen consistent increases in the diversity and quality of the students. There has been a 10% increase in women in first year engineering and a 50% increase in under-represented minorities in the graduate student class. Faculty numbers have increased by 30% to over 360 with a 75% increase in female faculty and 70% increase in other minority faculty. Williams serves on the State of Ohio’s Third Frontier Advisory Board, and is a Board Member of Lightweight Innovations for Tomorrow in Detroit, Columbus 2020, Metro Early College STEM School, the Ohio Aerospace & Aviation Council, and is Board Chair of the Transportation Research Center. Williams also represents Ohio State on the Council on Competitiveness and the Business-Higher Education Forum. 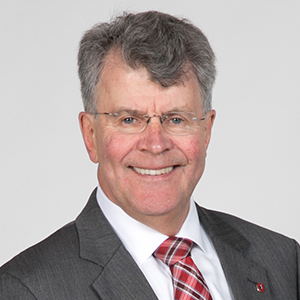 He is a member of the Global Engineering Dean’s Council, the Public Policy Committee of the American Society for Engineering Education Deans Council, the Ohio Aerospace and Aviation Technology Committee, and the Ohio Engineering Dean’s Council. Before joining UA Huntsville, Williams spent 31 years at Lehigh University in Bethlehem, PA, where was Harold Chambers Senior Professor of materials science and engineering. His research and administrative experiences were strongly supported by many federal agencies, including NSF, DOE, NASA and the U.S. Army. From 1980 to 1998, he directed Lehigh’s Electron Microscope Laboratory and the Microscopy School, long considered the world leader in electron microscopy education. He chaired Lehigh’s Materials Science and Engineering Department from 1992 to 2000 and was vice provost for research from 2000-2006. A native of Leeds, England, Williams holds B.A., M.A., Ph.D. and Sc.D. degrees from the University of Cambridge. He is a strong advocate for excellence in education and research, and is co-author and editor of 13 textbooks and conference proceedings and (co-) author of over 450 publications on the application of electron microscopy to studies of metals and alloys. He is co-author with Professor C. Barry Carter of the leading textbook, Transmission Electron Microscopy, which has sold over 20,000 copies and over 1 million chapter downloads. Williams has given over 300 invited talks in 30 countries. A current visiting professor at the University of Manchester School of Materials, he is a Fellow of six national and international professional societies in the areas of electron microscopy, materials science, aviation and aerospace engineering.